ᾳ῎δουσιν [adousin] , present tense: they are singing. A historical present which describes an event which has already transpired using the present tense for heightened vividness which transports the reader to the time of the action. In the OT, the tribe of Judah (meaning praise, Gen. Gen. 29:35) led the way into battle and so it is here (Jdg. Jdg. 20:18). These scenes of ecstatic heavenly worship are as lofty as the judgments which follow are severe. Both the living creatures and the elders sing this song. This has caused some to favor the variant reading of this verse which omits the we from the redeemed because the living creatures, being of an angelic order, are not among the redeemed.1 See below. New is καινὴν [kainēn] , new in quality. The new aspect of the song may be worship motivated by the impending opening of the scroll which for so many years has remained untouched. The words of this song record the unique initiation by the Lamb of the events which rapidly lead to the climax of history and the establishment of His kingdom. See commentary on Revelation 5:5 . See Revelation Rev. 6:1+. See commentary on Revelation 5:6.
ἠγόρασας [ēgorasas] : Mat. 13:1.44); figuratively, as being no longer controlled by sin set free; from the analogy of buying a slaves freedom for a price paid by a benefactor redeem (1Cor. 1Cor. 6:20).3 Redemption involves a purchase and those who are purchased are no longer their own (1Cor. 1Cor. 6:20; 1Cor. 7:23; 2Pe. 2Pe. 2:1). The purchased price for those redeemed was not made with corruptible things like silver and gold (1Pe. 1Pe. 1:18), but by the life of the Son of Man Who gave His life a ransom for many (Mtt. Mat. 20:28). The redemption in view is both soteriological (individual souls are reconciled to God) and eschatological (the original creation will be restored at last). This is similar to Boazs redemption of land for Naomi (Ru. Ru. 4:1-11). Like Boaz, Jesus is the Goel. The term Goel describes the person who is next of kin and his respective duties as kinsman-redeemer : to buy back what his poor brother has sold and cannot himself regain (Lev. Lev. 25:25-26); to avenge any wrong done to a next of kin, particularly murder (Num. Num. 35:12-27); to purchase land belonging to one deceased who was next of kin and to marry his widow and to raise up children for the deceased (Ru. Ru. 2:20; Ru. 4:14). There are small variations in the manuscript evidence for verses 9 and 10 which impinge on a significant theological issue: the identity of the twenty-four elders. Are the elders included among the redeemed or not? The TR text for these two verses (reflected in the KJV and NKJV) is shown below. We have marked the places where other manuscripts differ. A bloodless gospel is no gospel. Without the shedding of blood there is no remission of sin. The redeemed of this age are the church of God which He purchased with His own blood [emphasis added] (Acts Acts 20:28). Redemption provides for the forgiveness of sinthat which separates man from Godand was made possible through His blood [emphasis added] (Col. Col. 1:14). This is the reason why Christs blood is said to be precious (1Pe. 1Pe. 1:19).19 See commentary on Revelation 1:5. The global emphasis of this book is seen in this phrase and similar. The redeemed come out of all nations, tribes, peoples, and tongues (Rev. Rev. 7:9+). John is told to prophesy about many peoples, nations, tongues, and kings (Rev. Rev. 10:11+). The earth dwellers, who rejoice over the death of the two witnesses, represent the peoples, tribes, tongues, and nations (Rev. Rev. 11:9+). The worldwide scope of the Antichrists power is seen in that he is granted authority over every tribe, tongue, and nation (Rev. Rev. 13:7+). The gospel is preached by an angel to every nation, tribe, tongue, and people (Rev. Rev. 14:6+). The waters upon which the harlot sits are peoples, multitudes, nations, and tongues (Rev. Rev. 17:1+, Rev. 17:15+). The work of the Church is to reach these global peoples with the message of the gospel (Mark Mark 16:15) and results in a global harvest of incredible diversity. The four categories denote global extent. See Four: the Entire World, the Earth. These facts all stand against the preterist interpretation which would localize these passages to Jerusalem and the Mediterranean attending the fall of Jerusalem in A.D. 70 or the subsequent fall of Rome. 1 [Donald Grey Barnhouse, Revelation (Grand Rapids, MI: Zondervan Publishing House, 1971), 110] raises the question as to whether the living creatures may participate in the song having a personal experience of redemption. We feel this view has little merit. For one, Scripture is entirely silent as to this possibility. For another, upon what basis would angelic redemption be based? For Christ came as the God-man, born of a woman to regain that which was lost by the first man Adam. How could fallen angels profit from human redemption? Our ignorance concerning the angelic realm is only surpassed by our tendency toward unprofitable speculation concerning that which we cannot know. 2 Albrecht Durer (1471 - 1528). Image courtesy of the Connecticut College Wetmore Print Collection. 3 Timothy Friberg, Barbara Friberg, and Neva F. Miller, Analytical Lexicon of the Greek New Testament (Grand Rapids, MI: Baker Books, 2000), 33. 4 J. A. Seiss, The Apocalypse: Lectures on the Book of Revelation (Grand Rapids, MI: Zondervan Publishing House, 1966), 111. 5 Zane C. Hodges and Arthur L. Farstad, The Greek New Testament According To The Majority Text (Nashville, TN: Thomas Nelson Publishing, 1985), Rev. 5:9. 8 Jerome Smith, The New Treasury of Scripture Knowledge (Nashville, TN: Thomas Nelson Publishers, 1992), Rev. 5:9. 9 Seiss, The Apocalypse: Lectures on the Book of Revelation, 108*. 10 Regarding the identification of the twenty-four elders as angels, Thomas who holds such a view, observes: If any one of the three readings including ἡμα῀ς [hēmas] is correct, it would mean that those singing this song are among the redeemed. 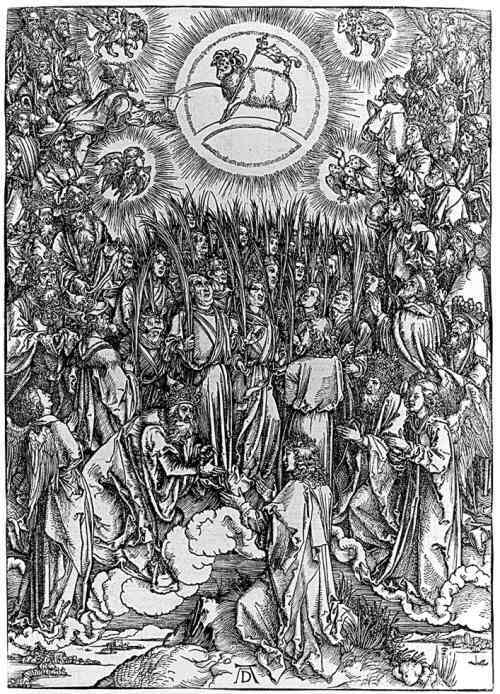 This would necessitate a reconsideration of the conclusions reached above regarding the identities of the four living beings and twenty-four elders [as angels]. Unquestionable manuscript support for inclusion of the pronoun is impressive.Robert L. Thomas, Revelation 1-7 (Chicago, IL: Moody Press, 1992), 410. 11 Bruce M. Metzger, A Textual Commentary on the Greek New Testament (Stuttgart, Germany: Deutsche Bibelgesellschaft, 1994), 666. 12 Thomas, Revelation 1-7, 410. 13 E. W. Bullinger, Commentary On Revelation (Grand Rapids, MI: Kregel Publications, 1984, 1935), 242. 14 John Niemel?, The Twenty-Four Elders and the Rapture (Orange, CA: Chafer Theological Seminary, 2005), 5. 15 A. R. Fausset, The Revelation of St. John the Divine, in Robert Jamieson, A. R. Fausset, and David Brown, A Commentary, Critical and Explanatory, on the Old and New Testaments (Oak Harbor, WA: Logos Research Systems, Inc., 1997, 1877), Rev. 5:9. 16 John MacArthur, Revelation 1-11 : The MacArthur New Testament Commentary (Chicago, IL: Moody Press, 1999), 172. 17 This passage illustrates the elasticity of the tenets of textual criticism and how easily its practitioners abandon their own grammatical heuristics when it seems useful. 18 J. Dwight Pentecost, Things to Come: A Study in Biblical Eschatology (Grand Rapids, MI: Zondervan Publishing House, 1958), 257. 19 Characteristics of Christs blood: Gen. Gen. 9:4; Ex. Ex. 12:23; Ex. 24:8; Lev. Lev. 17:11; Isa. Isa. 52:15; Zec. Zec. 9:11; Mtt. Mat. 26:28; Mat. 27:4; Luke Luke 22:20; John John 19:30; Acts Acts 20:28; Rom. Rom. 5:9; 1Cor. 1Cor. 10:16; Eph. Eph. 1:7; Eph. 2:13; Col Col. 1:14, Col. 1:20; Col. 2:14-15; Heb. Heb. 9:12, Heb. 9:14, Heb. 9:22; Heb. 10:19, Heb. 10:29; Heb. 11:28; Heb. 12:24; Heb. 13:12, Heb. 13:20; 1Pe. 1Pe. 1:18-19; 1Jn. 1Jn. 1:7; 1Jn. 5:8; Rev. Rev. 1:5+; Rev. 5:9+; Rev. 7:14+; Rev. 12:11+. 20 Thomas, Revelation 1-7, Revelation 5:9.